This classic combination of smooth chocolate and the best of summer cherries is marriage made in heaven. With the added tang of lime juice, the crunch of coconut and chocolate flakes, it will be a favourite. Place milk, KNORR Coconut Milk Powder and CARTE D’OR Chocolate Mousse Dessert Mix into a mixing bowl and beat for five minutes. Pour into a tray in approx. 2 cm thick layer and freeze until set. Drain the cherries and combine the cherry juice and sugar, cook until slightly thickened. Stir in the KNORR Lime Powder and pour over cherries, store for use. 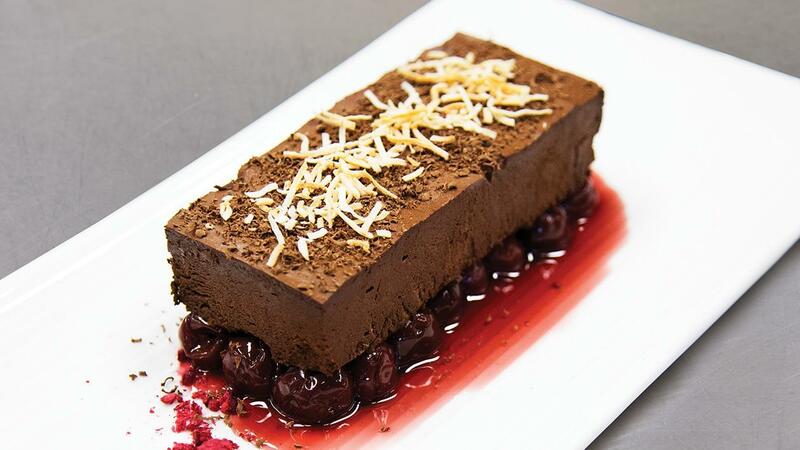 Cut the frozen mousse into squares. Place on top of cherries with some syrup. Sprinkle plate with freeze dried raspberries (fresh raspberries can be used) and combined chocolate and coconut.